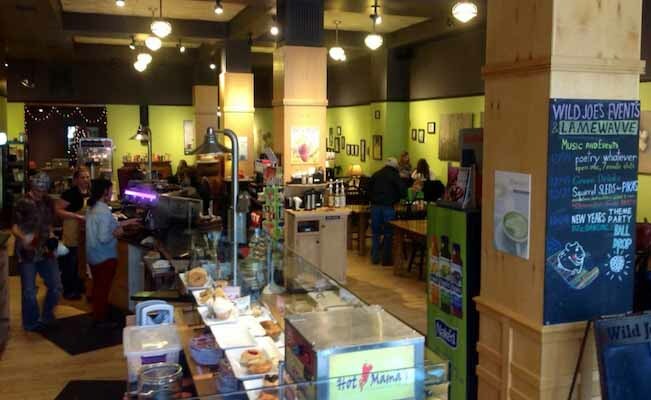 Wild Joe's Coffee Spot was voted Bozeman's best coffee house in the Best of Bozeman Survey 2013 and 2014. We are proud to serve fair trade coffees brewed and extracted on the best professional coffee making equipment available. Conveniently located on Main Street in the heart of downtown Bozeman. Offering a large comfortable setting with free wireless Internet and delicious fresh baked pastries. On the weekends Wild Joe's often hosts local and touring musicians and displays local artists work. Our coffee is roasted right here in Bozeman. All our menu and baked goods are local too. The menu features house made pizza and burritos from Hazen's Kitchen, Wilcoxsons Ice Cream, Sweet Pea Bakery, Bagelworks and much more.